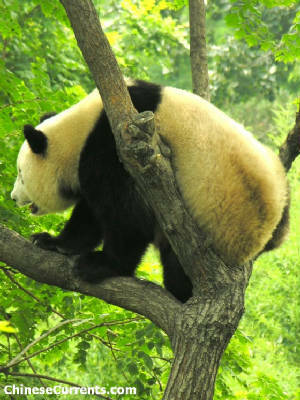 Wolong Giant Panda breeding centre – the world’s panda-breeding capital – houses around 100 Giant Pandas. That’s more captive pandas than are in the rest of the world’s zoos and facilities combined. Thankfully, even more survive in the surrounding 770 square miles of the Wolong National Park, which holds almost 10% of the total wild population of approximately 1,500 animals. I checked into the Wolong Hotel at 12.45pm. [The massive earthquake that devastated the area, tragically causing more than 80,000 deaths, would strike at 2.28pm on the same date – May 12th – one year later]. I had stayed at the same hotel in 2002, when it was one of only a few places in the town that were open to foreigners. Nowadays, many more hotels have sprung up to cater for the burgeoning demand for panda-driven ecotourism – the backbone of the town’s economy. According to the legend of the local blue-and-white-garbed Qiang people, a dragon was so struck by the beauty of the valley and the snow-capped peaks that flank it, that it sat down to admire the landscape and, fully contented, fell into an eternal sleep. It remains to be seen, however, just how much the “crouching dragon” – the literal meaning of “wo long” – will be disturbed by the opening of the new, fast road from Chengdu. Indeed, the number of people visiting the “Wolong Valley” could well increase nine-fold from 200,000 per year, nationalgeographic.com predicts. It is likely that pressure on the town’s infrastructure and the area’s ecosystem will further increase if the planned construction of the “Panda Mountain ecotourism destination” goes ahead. The proposal is to spend between US$ 7 to 8 million on building a tourist attraction that would sit next to the existing panda reserve, just south of Wolong. The US-China Environmental Fund (USCEF) promotes Panda Mountain as “12,000+ sq/mtrs of integrated lodging, educational, restaurant and retail facilities” that will yield a “net income of US$9.2 million in [the] first five years and US$13.6 million in [the] first seven years”. The plan is to open Panda Mountain before the start of next year’s Olympics, so that it will be able to capitalise on the expected overflow of Beijing-bound Olympic tourists that will be whist from Chengdu airport to Wolong in less than two hours on the new wide road. The increasing tourism activity in the vicinity obviously concerns UNESCO, which excluded Wolong from the area that was designated a world heritage site in 2006. 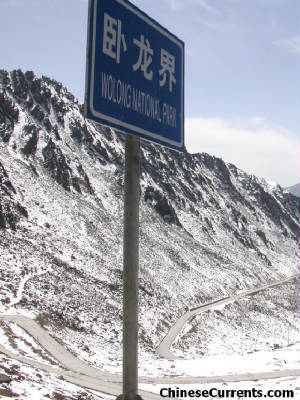 The evaluation report of May 2006 which advised the decision making body that the site met the criteria for acceptance as a “natural” world heritage site, also recommended that the State Party should “undertake an independent expert review of the existing [Wolong Tourism Development] plan, under the direction of the World Heritage Management Office to assess the impacts of the [plan’s] proposals on values within the nominated property and to recommend modifications that may be required.” I look forward to reading the environmental impact assessment report that emerges from this review. The “Sichuan Giant Panda Sanctuaries” – comprising seven nature reserves and nine scenic parks in 924,500 hectares of the Qionglai and Jiajin Mountains – is one of only six sites in China to be designated a “natural” world heritage site. It hosts a dazzling array of plant and animals, including some 5,000 to 6,000 plant species – more than any other temperate site. There are in excess of 100 species of rhododendrons alone. Also, according to the evaluation report, there are 132 mammal species; and more than 365 species of birds. So, literally thousands of reasons, then, why it is critically important that the site is afforded maximum protection. One of the most spectacular of the site’s species breeds in good numbers on the steep hillside that rises literally over the wall of the Wolong Hotel. Hearing a Golden Pheasant is one thing; seeing one is quite another. I chatted with some locals nearby, one of whom told me that he could easily find a look-out point high above the town – the path to which, I was told, wends through some good areas for Golden Pheasants. Mr Yu, who is a primary school teacher, was immediately hired to be the trekking-guide for the afternoon; and rushed home to change into his hill-walking shoes. Despite a four hour dash up and around the mountain and Mr Yu’s best efforts, the Golden Pheasant remained hidden – although many were heard. 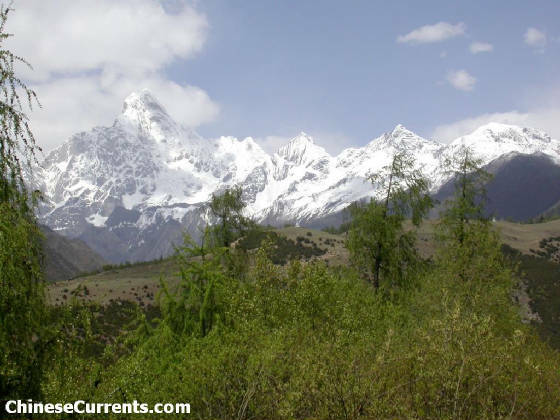 Wolong is on the outer strand of the Qinghai-Tibetan climatic belt, which is characterised by long snowy winters (from November to March) and relatively cool wet summers. Rainfall varies considerably by altitude range, but whatever height you are at the chances are that it’s going to be wet. The panda research station at Wuyipeng, which was set up in the early 80s thanks to a grant from the WWF (wildlife not wrestling), is one of the wetter places in the area. Doctor Schaller, who led the WWF’s panda research effort, recorded 2,520mm of precipitation there in 1985. And so, with that in mind, it wasn't a surprise that it was raining torrentially when I emerged from the hotel at 5.30am. An hour or so later, at about 7,700 feet above sea level, the distinctive call of Golden Pheasant was heard; and a few minutes later, the male showed very well indeed – at one point walking on to the track and weaving its magic only ten yards away. Somehow, the seclusion and glorious silence of this place – the only sound was the soft, rhythmic patter of rain against leaves – made the experience even more spell-binding (certainly beats seeing “introduced” Golden Pheasants in southern England). Remarkably, this is the exact location where I saw a wild panda five years before (but that’s another story…). Then at 9.10am, some 400 yards beyond and ten minutes after the start of the Wuyipeng “plateau” (8,375 feet), I saw something that reclassified Golden Pheasant and just about every other bird I have ever seen. The resplendent male Temminck’s Tragopan – “psychedelic turkey” just about conjures up the right image – strolled across the track, pecked unconcernedly for a few moments, before continuing up the hill. Amazingly, only two birds had been seen during the two and a half hour ascent in the pouring rain – a male Golden Pheasant and a male Temminck’s Tragopan. The footpath from the start of the ridge to the panda research station extends for a mile through a mixture of superb habitat, including sky-scraping deciduous trees, extensive tracts of bamboo, and tall conifers. Mr Xu, the research station’s administrator and cook, was waiting with a warming cup of tea. He has been here for 15 “seasons” – from about April to September – and is very much the reason why a run-down, cold and damp research station is actually a pleasant place to stay for a few days. After cooking an excellent meal, Mr Xu sat down for a chat. I asked him how many tourists have actually managed to see a wild panda. “Hen shao” (very few) he said with a shrug of his shoulders. “Are these tailored panda-finding tours all they are cracked up to be,” I asked casually. It was clear from Mr Xu’s frosty reaction that I had clumsily hit a nerve. “If they are there, my colleagues will find them,” he replied tersely. Mr Xu looked at me quizzically. It was clear from his response that the “disappearance” of Xiang Xiang – the first captive bred panda to be released into the wild – was a major embarrassment. “Bitten and frightened away by the wild pandas,” he said. “Where did it go,” I unwisely asked. “His transmitter stopped working,” was his final word on the matter. This sounded very much like a euphemism for “he’s dead”, and so I decided to spare both of our blushes and steer well clear of any more panda-talk. “Do you like watching English football?”, I enquired, gesturing to the six foot diameter satellite dish outside the window.